I've practical question here regarding how the IDE behaves. 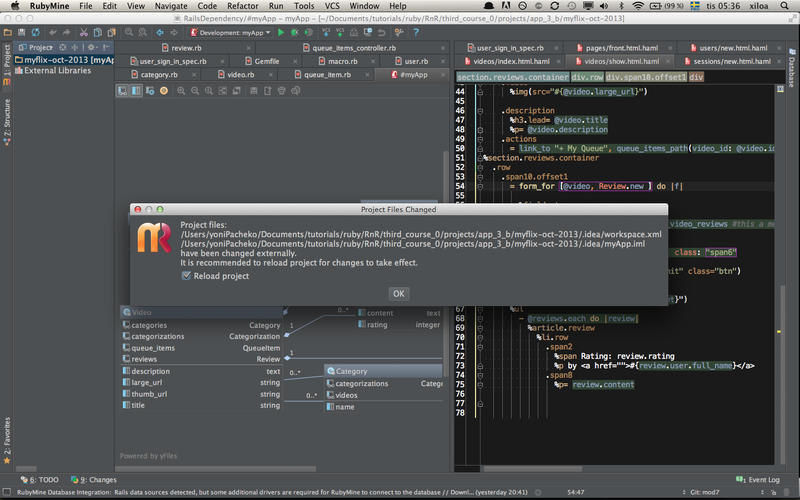 This the second time that my IDE tells me that the XML file has been changed from outside. Unfortunately I can't remember more than that (if this happen next time I'll take a pix). I clicked though OK and my lastest code was gone. Fortunately this time I've everything in my remote repo. Somehow the file has been changed by some other process (perhaps some process you have started within IDE) or IDE has mistakenly decided that it was modified. ok! I was working with GIT outside the IDE, any thoughts about it? Yes, it may be cause of the problem. Well, I'm using git in command line from time to time and usually have no problems with RubyMine. I'd suggest to try to identify the use case when git causes (if it does) the problem and after that we could try to find a workaround for it. Listen I'm having big issues with my models...Rubymine doesnt recognizre the relations in bwt them, as I understand there's a bug...but I can't find any solution...do u know something about it? Anyway, I'd suggest to start a new thread about this problem. Now I wondering how do I deal with this issue? what I did was to unclick the check-box : reload project, was it right? How shall I avoid this message in the future? Any idea? thanks!